Can anyone tell me what the difference is between the Revenue Cycle Model and the Lead Lifecycle? Do they integrate together? I understand the RCM function - however, I was also recently introduced to the Lead Lifecycle and was unsure what is the purpose of having both. I use them in tandem because that was the recommended set up from my consultant when I was implementing my instance a few years ago. From what I saw, they appear to work well hand in hand. I have two lifecycles - customer and prospect (so that's two fields where I track their lifecycle status, if they are a customer prospect lifecycle = customer and then customer lifecycle can move through the stages), but I only have one revenue cycle modeler that encompasses prospect to customer and customer to cross sell. I was confused about why we used both when they seem to be the same thing, but my consultant assured me that it's easier to manage both and to use them to confirm the other. There have been times I've found the RCM to be incorrect based off of where the Lead Lifecycle is. I'd love to see what other people say, since I don't feel like I ever got a good answer! The Revenue Cycle Model is a flow chart containing specific stages with arrows (transitions) indicating how the leads move between these stages. It's a visual representation of the marketing and sales funnel that shows how a lead can move from one stage to the next, with the goal being to have the lead transition to the closed/won stage. The top-of-the-funnel is typically marketing's responsibility while the bottom-of-the-funnel is sales responsibility, but both should have a solid understanding of the funnel from start-to-finish. 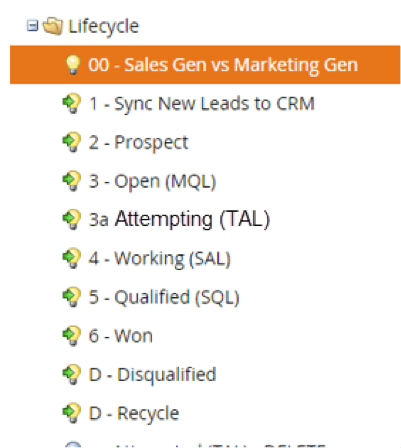 The lead lifecycle is a series of smart campaigns that manage the transitions and rules for each stage in the RCM (per the agreed upon SLAs as defined by sales and marketing). Screenshot is below. Implementing RCM will allow you to start utilizing Revenue Cycle Analytics (RCA), which allows you to see beyond what the present state of the revenue stages are, and helps you explore the history of the revenue cycle model via Success Path Analyzer or Revenue Cycle Explorer (RCE). Is it possible to fit a longer string of text on the Revenue Cycle Model flow chart? We have a status Meeting Set (SAL) and I'm having trouble showing the entire line and was curious if there was some sort of work around for this.